Black Friday and Cyber Week are over but the deals continue on amazon.com. The Amazon Holiday Deals page showcases the top deals from various categories on amazon.com. Save on your holiday shopping ans support your Tripawds community while you’re at it! New this year: Save 25% or more on popular kids’ gift items in the Amazon Holiday Toy List! Find the perfect gifts for kids by age, gender, category, and price. Save on top toys, games, electronics, video games, and more! 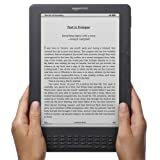 Kindle is the #1 Bestselling, #1 Most-Wished-For and #1 Most-Gifted product on Amazon.com! Need we say more? Ho-ho-holiday! It’s the giving-est time of the year, and if you’re looking for help with gift ideas for everyone on your list, Amazon.com offers the “Something for Everyone” event on the Gifts & Wish Lists page. From heated throws for Mom to poker night accessories for the boyfriend or husband to Nerf for the kids, Amazon.com has plenty of unexpected ides in every price range to wrap up a joyful holiday season. To see all of the great gift ideas Amazon has collected for this event, which runs through Dec. 25, go here. Amazon MP3’s holiday deals don’t end with Black Friday and Cyber Monday – this season Amazon is keeping the deals going in the Holiday MP3 Store. There, you’ll find this year’s Holiday releases, playlists for all occasions, and a new free holiday song every day through Christmas, $5 holiday albums, and more. In addition to the regular selection of $5 albums, Amazon has added an additional 100 holiday albums for $5 to get everyone in the holiday spirit. These $5 albums include some of the biggest and best new releases of 2010 as well as classic must-have albums. On top of that we’re also revealing one new holiday song each day until December 25 as part of our annual 25 Days of Free Music promotion. Also, you can now give any MP3 song or album in the entire store as an easy instant gift. Send your visitors to our MP3 Gift Guide to find the perfect gift for everyone on your holiday shopping list. Please remember to start all your Amazon searches here when shopping this holiday season!